Two stories tell of Pohaku O Kauai, here. The most audacious terrestrial undertaking of Maui was his attempt to rearrange the islands of the group and assemble them into one solid mass. He went to Kaʻena Point and cast his magical hook, Mana-ia-ka-lani, far out into the ocean that it might engage itself In the foundations of Kauai. When he felt that it had taken a good hold, he gave a mighty tug at the line. A huge boulder, the Pohaku o Kauai, fell at his feet. The second story of Pohaku O Kauai is written by Westervelt: A long time ago there lived on Kauai a man of wonderful power, Hau-pu. When he was born, the signs of a demi-god were over the house of his birth. Lightning flashed through the skies, and thunder reverberated – signs of the birth or death or some very unusual occurrence in the life of a chief. Mighty floods of rain fell and poured in torrents down the mountain-sides, carrying the red soil into the valleys in such quantities that the rapids and the waterfalls became the color of blood, and the natives called this a blood-rain. Then a beautiful rainbow formed over the house in which the young chief was born. This rainbow was thought to come from the miraculous powers of the new-born child shining out from him instead of from the sunlight around him. Hau-pu while a child was very powerful, and after he grew up was widely known as a great warrior. He would attack and defeat armies of his enemies without aid from any person. His spear was like a mighty weapon, sometimes piercing a host of enemies, and sometimes putting aside all opposition when he thrust it into the ranks of his opponents. If he had thrown his spear and if fighting with his bare hands did not vanquish his foes, he would leap to the hillside, tear up a great tree, and with it sweep away all before him as if he were wielding a huge broom. He was known and feared throughout all the Hawaiian Islands. One night he lay sleeping on the side of a mountain which faced the neighboring island of Oʻahu. When clouds were on the face of the sea, these islands were hidden from each other; but when they lifted, the rugged valleys of the mountains on one island could be clearly seen from the other. This night the strong man stirred in his sleep. Indistinct noises seemed to surround his house. He turned over and dropped off into slumber again. Soon he was aroused a second time, and he was awake enough to hear shouts of men far, far away. Louder rose the noise mixed with the roar of the great surf waves, so he realized that it came from the sea, and he then forced himself to rise and he looked out toward Oʻahu. He blindly rushed out to the edge of a high precipice which overlooked the channel. Evidently many boats and many people were out in the sea below. He laughed, and stooped down and tore a huge rock from its place. This he swung back and forth, back and forth, back and forth, until he gave it great impetus which added to his own miraculous power sent it far out over the sea. Like a great cloud it rose in the heavens and, as if blown by swift winds, sped on its way. Over on the shores of Oahu a chief whose name was Kaʻena had called his people out for a night’s fishing. Canoes large and small came from all along the coast. Torches without number had been made and placed in the canoes. Nets had been set in the best places. Fish of all kinds were to be aroused and frightened into the nets. Flashing lights, splashing paddles, and clamor from hundreds of voices resounded all around the nets. Gradually the canoes came nearer and nearer the centre. The shouting increased. Great joy ruled the tumult which drowned the roar of the waves. Suddenly something like a bird as large as a mountain seemed to be above, and then with a mighty sound like the roar of winds it descended upon them. Smashed and submerged were the canoes when the huge boulder thrown by Hau-pu hurled itself upon them. The chief Kaʻena and his canoe were in the centre of this terrible mass of wreckage, and he and many of his people lost their lives. The rock thrown by Hau-pu embedded itself in the depths of the ocean, but its head rose far above the water, even when raging storms dashed turbulent waves against it. To this death-dealing rock the natives gave the name Pohaku O Kauai (“Rock of Kauai.”) (Westervelt) The image shows Kaʻena Point. 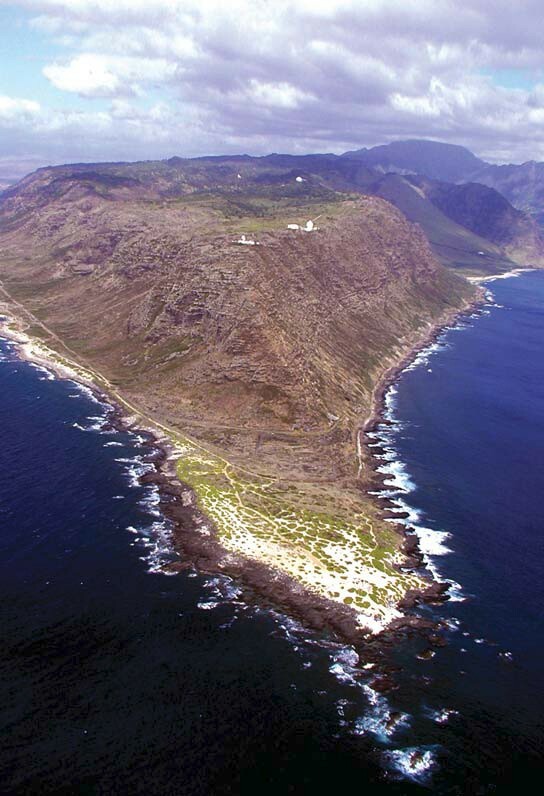 Keawaʻula was believed to be part of the Kaʻena Point leina a ka ʻuhane (leaping places of souls into the spirit world;) at the northern part of the Waiʻanae coastline, it is at the western most point of Oʻahu. When the privately-owned lands along the coast were acquired by the State of Hawaiʻi in the 1970s to create Kaʻena Point State Park, all were owned by ranching interests or by families with ranching interests in the area. The Keawaʻula section of the point was owned by Elizabeth Marks who inherited McCandless Ranch. 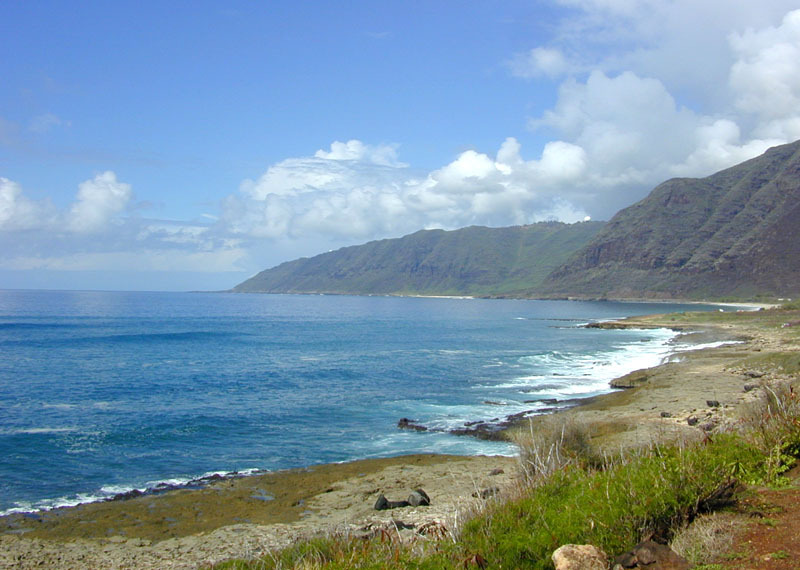 The Bay is at the beginning of the Kaʻena Natural Area Reserve. There is a lifeguard and restroom (only at the reserve entrance;) no facilities exist beyond that point. Under the Natural Area Reserve system, off-road driving is prohibited in the area to protect native plant and animal habitats. 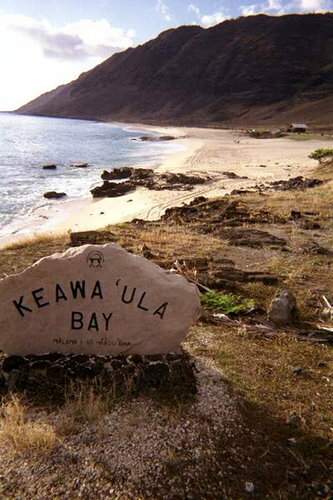 The image shows Keawaʻula Bay. In addition, I have added other related images in a folder of like name in the Photos section on my Facebook and Google+ pages.